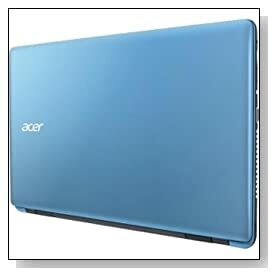 Blue Acer Aspire NX.MS8AA.001; E5-531-C7Y7 is a 15.6 inch modern entry level notebook with a 4th generation Intel Celeron processor, Windows 7 operating system, up to 7 hours battery life, decent image quality and a good variety of connectivity including Bluetooth, a faster USB 3.0 and even a DVD drive that often doesn’t exist in modern day machines. Acer Aspire comes with the ultra low voltage dual core Haswell Intel Celeron 2957U (2MB cache) at 1.4GHz base speed with no turbo boost or hyper threading, 4 GB DDR3L SDRAM for proper multitasking- able to run a few things at the same time without much delays or freezing, spacious 500 GB Serial ATA hard drive at 5400 rpm rotating speed for multimedia and standard files with quick read/write times and the much loved Windows 7 Home Premium 64-bit operating system. The Celeron processor and 4GB system memory should give you enough power and capability for smoothly handling your day-to-day tasks. 15.6 inch glossy Active Matrix TFT Color LCD LED-backlit screen with 1366 x 768 pixel maximum screen resolution and 16:9 cinematic aspect ratio equals to good picture quality with vivid colours and sharp text. The Intel HD graphics (Haswell) with shared memory can be compared to the Radeon HD 8250 or Intel HD 3000 in performance and you can only play very few current games and at lower resolutions and settings only and you’ll be fine with older and lighter games. Sound is fine through the integrated sound card and stereo speakers and the webcam is a regular HD webcam with built-in microphone for live chats on Skype. Blue Acer Aspire weighs 5.51 pounds with the measurements of 15 x 10.10 x 1.20 inches (0.96 inch thick at the front)- quite portable and can be conveniently taken out and about as you will be getting up to 7 hour battery life in normal use from its 6-cell 2500 mAh lithium ion battery- partly thanks to the very low voltage Haswell Celeron CPU. Keyboard is comfortable enough and has a numeric pad for convenient number crunching and a responsive multi-touch gesture TouchPad pointing device but of course you may feel more comfortable with a wireless mouse. Connectivity options include Acer Nplify 802.11bgn wireless, Gigabit LAN with RJ-45 connectivity, Bluetooth 4.0, 2 x USB 2.0 ports, 1 x USB 3.0 port, DVD Super Multi Optical Drive, an HDMI port, Memory Card Reader (Secure Digital) and 2 Memory Slots to let you expand the memory capacity if needed. 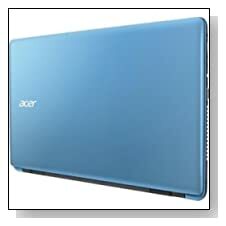 Conclusion: Acer Aspire NX.MS8AA.001; E5-531-C7Y7 is a good computer for everyday things like audio and video streaming, internet surfing, word processing- for both work and entertainment. Released at the beginning of 2014, the 4th generation Celeron processor is clocked at 1.4 GHz and doesn’t move up in speed (no turbo boost function) as in the case of many i3 or i5 processors and also the hyper threading function is deactivated but is an ultra low voltage one to help with longer battery life and being a 2014 release Haswell processor it is equipped with modern features despite the seemingly low Ghz- it is more of an entry level processor with adequate power to let you function well in daily multimedia and office tasks. The graphics card Intel HD (Haswell) is an integrated one that is much slower than Intel HD 4400 and higher versions, so only light gaming is allowed but adequate for general multimedia. 4GB is plenty for multitasking in most cases and will let you launch applications quickly and can be expanded to 16GB. Aspire E5 is offered with a 1 year standard limited warranty by Acer if anything goes wrong.